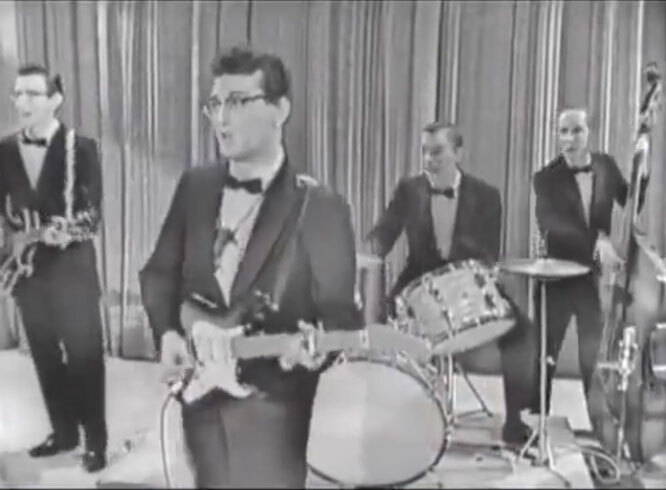 Buddy Holly performs "That'll Be The Day"
"That'll Be the Day" is a song written by Buddy Holly and Jerry Allison. It was first recorded by Buddy Holly and the Three Tunes in 1956 and was re-recorded in 1957 by Holly and his new band, the Crickets. The 1957 recording achieved widespread success. Holly's producer, Norman Petty, was credited as a co-writer, although he did not contribute to the composition. Many other versions have been recorded. It was the first song recorded (as a demonstration disc) by the Quarrymen, the skiffle group that evolved into the Beatles. The 1957 recording was certified gold (for over a million US sales) by the Recording Industry Association of America (RIAA) in 1969. It was inducted into the Grammy Hall of Fame in 1998. It was placed in the National Recording Registry, a list of sound recordings that "are culturally, historically, or aesthetically important, and/or inform or reflect life in the United States", in 2005.